A Guide To Slipped On Water In A Supermarket Claims – How Much Compensation Can I Claim? Have you slipped on water or another spilt liquid in a supermarket? There are a variety of different things which can lead you to have a slip, trip, or fall accident when you are out shopping, but a leading cause is still slipping over on a spillage of some kind. Put simply, wet floors can be very hazardous and can cause many more injuries than people commonly think. These types of injuries can happen not just in food retailers, but anywhere with a polished or shiny floor which is regularly cleaned with fluids. Wet floors can be hazardous and are especially hazardous if there is not appropriate signage to demarcate them. All business (such as shops, shopping centres and supermarkets), which own and are responsible for spaces used by the public have a duty of care to ensure that their space is safe for people to use. 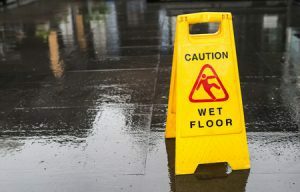 If you have slipped over in a supermarket or other such shop and your fall was caused by something which the supermarket could have taken reasonable steps to prevent (such as cleaning it up or placing a wet floor sign to highlight it), you may be able to claim compensation for any injuries you sustained. If you have been injured as a result of slipping over on a wet floor, talk to the personal injury claim specialists at Legal Expert. Our team will connect you with one of our panel of specialist personal injury solicitors who can work on your case. Contact us today and we will help you get the compensation you deserve. What Are Slipped On Water In Supermarket Accidents? How Much Compensation Can I Get For Slipping On A Wet Floor? If I Slip In A Supermarket, Can I Make A Claim? How Much Compensation Can I Claim For A Wet Floor Injury? Before we look further into accidents where people have slipped over on water in a supermarket, it is worth noting that not all injuries caused by slipping on a wet floor will entitle someone to compensation. For instance, if you caused the spill you slip on, you may well not be able to make a claim However, there are many types of accidents where you are entitled to make a claim. The average supermarket is full of a variety of different cans, bottles, jars, and cartons, all of which contain different liquids. These could be food stuffs, drinks and even household cleaning products. During the course of an average day in a supermarket, some of these containers will be knocked over, breaking the container and spilling the contents. With the number of customers and shoppers moving through a supermarket, it is almost unavoidable for supermarkets to have at least one or two spills a day. Any liquids which are spilled onto a smooth or very polished floor will instantly make that floor a hazard to walk over. Due to the low friction, even standing on the spilled water in normal shoes or trainers can be enough to make some people slip over. As it is so easy to slip over on a spillage and injure yourself, supermarkets have a duty of care to ensure they prevent any such slips, trips and falls by effectively placing signage by a spill and then effectively cleaning it up. Any spill needs to have sufficient signage to notify both customers and other staff members. If this signage is not put in place, and if the supermarket does not comply with their obligation to clean it up straightaway, they may be liable for any injuries which are suffered by people falling over on the spill. A lack of visible wet floor signs are one of the biggest causes of people slipping over on a wet floor in a supermarket. It is important that signs are placed such that passers by will see the sign before reaching the spill. When floors are being mopped or cleaned as part of the daily cleaning routine, the affected area should be clearly demarcated with wet floor signs to indicate the danger to customers and other employees. If you have had a slip, trip or fall caused by a wet floor in a supermarket, it is important to gather as much evidence as you can to support your claim. Doing so will help solicitors later acting on your behalf to successfully pursue your compensation claim. Evidence should include taking photos of the wet floor as well as photographing whether or not there are any (visible) wet floor signs. Try to find out how long the floor has been left like this. Did the supermarket react quickly enough to the spill? Gathering evidence will help us to demonstrate that the supermarket had enough time to reasonalbly have cleaned up the spill and have been negligent in not doing so. How Much Compensation For Slipping On A Wet Floor? Spills frequently occur in supermarkets. They can very often result in injuries to staff or customers. Figures from the UK’s Health and Safety Executive show that having a slip, trip or a fall (on the same level) is the most common type of workplace accident in the UK. An example of a wet floor injury could be a fall in the chilled foods aisle. If a carton of milk or juice is spilled, the liquid will very quickly spread across and down the aisle. This will cause a hazardously wet floor. If this spill is not immediately marked out with wet floor signs and a member of staff sent to clean it up, it can be argued that there was sufficient time to to prevent people slipping on it. If a customer or member of staff, who were unaware of the spill, slips on the wet floor, they could be entitled to make a claim. In a case such as this, the supermarket has been negligent. Slips, trips and falls can occur due to negligence. A good example of negligence could be spills not being cleaned up correctly or quickly enough. Negligence can also lead to water or other liquids being left on the floor in a hazardous way whilst other tasks are carried out. If this was case for your accident, it can be argued that an accident occurring was a reasonably foreseeable consequence. In the context of a personal injury claim, a foreseeable action is one which is could be reasonably expected to be known. If water or another liquid is left on a supermarket floor, it could be reasonably foreseen that a customer, or other employee, could fall on the water. This reasonably foreseeable negligence can form the basis of a supermarket compensation claim. According to the HSE, slips trips and falls are one of the most common types of accident. Head injuries caused by falling over can also be a leading cause of traumatic brain injuries. TBI’s (or traumatic brain injuries) can cause everything from a mild concussion which will heal with some rest, through to more severe injuries which can cause lasting symptoms. A very high degree of broken or fractured hips are caused by falling over. Hip fractures are the most common serious injury for elderly people and falls are the leading cause of these. Hip or other bone fractures will result in hospitalisation and long-term rehabilitation. Slipping or falling over can very often lead to the person twisting their knee or ankle, spraining the tendons and ligaments in the affected joint(s). The impact from a fall onto a hard surface can lead to damage to the back. This includes symptoms such as herniated discs or more serious symptoms, including injuries to the spine. Many of these injuries can bevery painful and can result in the victim having to have corrective surgery to fully recover. If you have slipped on water in a supermarket you may well be able to make a claim for compensation. All business have a duty of care to customers and staff alike. This duty of care states that the shop must ensure that their environment is safe for all users. The 1957 Occupiers Liability Act sets out this duty of care. If the supermarket failed in their duty of care, and someone has been injured, the victim is entitled to make a claim for any injuries or financial losses they have suffered. If you have slipped on water in a supermarket, you can claim compensation for an array of different damages. When making a claim against a supermarket, your compensation award will vary, depending in large part on the nature and severity of your injuries. There are two main types of damages which are awarded in personal injury cases. These are called general damages and special damages. General damages: These damages award compensation for any physical or psychological injuries a victim has suffered as a result of the accident. If you are making a compensation claim for having slipped on water in a supermarket, your physical and emotional injuries will be taken into account. Often general damages will make up the bulk of the compensation awarded. Special damages: Special damages cover financial costs and losses suffered by a claimant. If the claimant has lost earnings as a result of an accident, this will be recovered as part of a compensation claim. Special damages also go further than this. They can include any out of pocket expenses the victim has incurred. This could include travelling to medical examinations, or the cost of adapting their home or vehicle to meet any new physical restrictions. At the start of your claim, it can be difficult to give an accurate figure for how much your injury claim could be worth or to give you a precise figure as to how much you could be entitled to in special damages. How much compensation you will be entitled to after slipping on a wet floor will depend on the circumstances of your case. Whilst estimates can be given based on previous and similar cases, no two accidents or injuries are ever quite the same. Personal injury claims are always a little bit different and two people with the same injury could experience symptoms for differing amounts of time. How much compensation you are entitled to for a fall in a supermarket changes from person to person. Below, we have set out a table which helps to illustrate some of the amounts of damages people have received in past cases. These awards are in line with guidelines from the Judicial College. Neck Injuries Severe £50,000 - £99,500 Serious fractures or damage to spinal discs which can cause disabilities. This can result in permanent damage and substantial loss of movement inthe neck. Neck Injuries (fracture) Severe £34,575 - £42,550 Including fractures and dislocations as well as damage to the surrounding soft tissue and tendons. This can lead to chronic conditions. Neck Injuries Moderate £19,000 - £29,250 Including more moderate dislocations of the tendons and soft tissues. More moderate fractures. Neck Injuries Minor £3,300 - £6,000 Minor injuries which will be recoverable from within a two year period. Back Injuries Severe £29,475 - £53,000 Fractures to the discs or vertabral bodies. Also includes soft tissue damage which leads to long-term, chronic conditions and symptoms. Back Injuries Moderate £21,100 - £29,475 Encompassing a wide variety of injuries such as crush/ compression fractures and where there is a substantial risk of lasting osteoarthritis. There is also lasting pain and discomfort. Leg Injuries Moderate £21,100 - £29,800 Damage to the knee resulting in an imperfect union of fractures (after repair), muscle wasting and limited joint movements. Also resulting in instability in the knee. Leg Injuries Serious £13,650 - £21,100 Fractures where a complete recovery is made, or damage to the soft tissue which is recovered from. Leg Injuries Moderate £6,925 - £10,700 Simple fractures (such as to the femur) where their is not lasting damage. Knee Injuries Serious £53,000 - £73,125 Including knee injuries where the joint is disrupted and the person will develop osteoarthritis. Knee Injuries Serious £39,625 - £53,000 A fracture which extends into the knee joint and which causes lasting pain and discomfort. If you have slipped on water in a supermarket and are looking to get the compensation you deserve, making a claim on your own can be a daunting task. As well as being very time consuming, making a claim can also be very costly. Without some help, it can simply be too complicated and expensive. Many people who are already facing financial hardship as a result of their initial accident will find the additional burdeon of paying solicitors fees too prohibitative. If you are already struggling to make ends meet, the extra costs of upfront or onging solicitors fees could make you drop your claim. No win no fee legal services were introduced to mitigate this. Using what most people know as a ‘no win no fee’ agreement, (also known as a Conditional Fee Agreement) our pannel of solicitors won’t ask for a penny upfront. We will work to recover the money you are owed and you won’t have to make any payments towards your claim costs during the course of the case. If your case is unsuccessful, and we can’t claim any compensation for you, your no win no fee agreement makes it clear that you are not liable for any costs incurred by the solicitors. If your claim is successful and you are awarded compensation, our fee will be included as a part of the claim. The conditional fee agreement (the technical name for a no win no fee case) sets out the total fee which the solicitors will be owed from the claim award. Some people are concerned about how much this will be , worrying that they will lose a large part of their award. By law, you must retain at least 75% of the total compensation award. Talk to Legal Expert today to start using our no win no fee services and get the compensation you deserve. If the supermarket has not instituted the correct slips trips and falls training for staff members, you may be able to make a claims for compensation. Personal injury claims have a statutory time limit. Whilst there is some variation, a good rule is that the claims must be brought within three years of either the initial accident or the presentation of symptoms. After this time has passed, the court can refuse to hear the case. However, there are exceptions to this three-year time-frame. If you were under the age of 18 when the accident/ injury happened (and a claim has not been made on your behalf) your three-year time limit will run from your 18th to your 21st birthdays. There are also exceptions if at the time of the accident you were not aware that you had been injured, or if there were no symptoms of an injury. In some cases symptoms of aninjury or illness may not present till several years after the initial accident which caused them. In these cases, the three year period will begin from when the symptoms first started to present. Your solicitor will be able to give you more detailed information on this. There are also other accident and injury types where the three year period may be different. If your accident has been caused by a defective product, the time period is just two years. Three years might sound like a long period of time within which to make a claim, however, it is not. In many cases, the preparation of a case for trial can take as long as three years. This can be caused by waiting to receive the correct medical diagnosis and treatment to take effect. Making a compensation claim for a slip, trip or fall in a supermarket due to water or other liquids on the floor is never an easy or enjoyable process without expert help and guidance. Even if your accident or injuries were not too serious, or if you are not in too much pain, it can take a long time to complete a claim. As such, when we start working on your compensation case, we will work with you to ensure that the whole claims process is as pain-free as it can be. The first step of any personal injury claims process is being able to secure the best legal advice on the market. This is where the legal specialist solicitors at Legal Expert can help you. We can work with you on a no win no fee basis. We can start working with you by discussing your case in a no obligation advice session. During this session, we give you the best advice on how to move forward with making a compensation case. During this consultation, we will talk through your case with you and may ask several questions. This will be to establish the basis of your claim and start to establish the supermarkets liability. We may ask where and when the accident happened, the circumstances around it, the nature of your injuries, and what evidence you have already gathered. We also ask if you have suffered any financial losses and costs as part of the accident. After establishing all of this, we will be able to make an offer for a no win no fee agreement with you and formally start working on your case. Why Use Us For Your Slipped On Water In A Supermarket Claim? Accidents in supermarkets, shops, and shopping centres are more common than many people think. Having a slip, trip or a fall can cause a variety of different injuries to claimants. They can happen to staff and customers alike and can leave people with physical or psychological injuries. These consequences of injuries can last for weeks, months, or even years down the line from the accident. They can prevent victims from being able to participate in activities they did before and force people them to live their lives in a different way. Our specialist solicitors will be able to recover the compensation you are entitled too. People choose to work with Legal Expert for a host of different reasons. Our specialist legal solicitors are on hand to provide you with the best legal advice available. Thanks to our dedicated staff, you can benefit from a variety of expertise and experience. Our solicitors will start by reviewing the details of your case through an initial (on obligation) consultation. From start to finish, our aim will be to support you through your recovery. At Legal Expert we are dedicated to claiming you the compensation you deserve. Contact the personal injury specialists at Legal Expert straight away. Our team are on hand seven days a week to start working with you. We will work to recover the compensation you deserve after you have slipped, tripped, or fallen over in a supermarket. We work with people across the country, supporting them through their claim. Talk to Legal Expert today and our team will begin working on your compensation claim straight away. We will talk through your claim and what you may be entitled to under Judicial College guidelines. To contact our experts, fill in our contact form (to the left) or use our online chat feature to speak to an advisor. Alternatively, you can talk to us by phone on 0800 073 8804, or drop us an email. Find out more about how to claim compensation for slip, trip and fall injuries. Discover more about how to make a compensation claim for a slip, trip or fall at work compensation claim.